At the age of 28, Benjamin Franklin wrote this mock epitaph. (1) Over the years, he wrote different versions and passed them out to friends. Benjamin Franklin loved books. He was very smart. Soon after he learned how to talk, he taught himself how to read. It soon became his favorite pasttime. (2) But there were no lending libraries in his hometown of Boston. There were ten bookstores there, but books were expensive and hard to come by, as most of them came from Europe. And there were really no children’s stories. Benjamin’s father – a soap and candle maker – did not have many books at home, only serious religious diatribes and the Bible. No matter; Benjamin read them anyway. 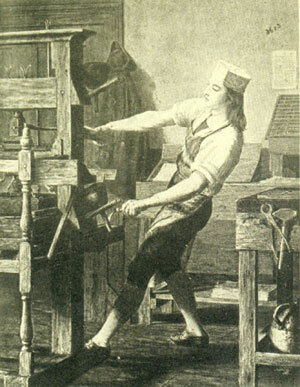 Engraving based on "The Young Franklin" by E. Wood Perry, showing Benjamin Franklin working a press in his brother's shop in Boston where he worked from 1718-1723. He also read books that were freshly printed in his brother’s shop. At the end of a workday, Benjamin often would take the new books home with him and stay up all night reading. The next day, he handed them over to customers, fresh and clean, none the worse for wear. At age 17, Benjamin was tired of working for his brother James and ran off to Philadelphia, seeking a fresh start in a new city. He found work as a printer and formed a circle of friends who liked to argue and read books. The group was called the Junto. 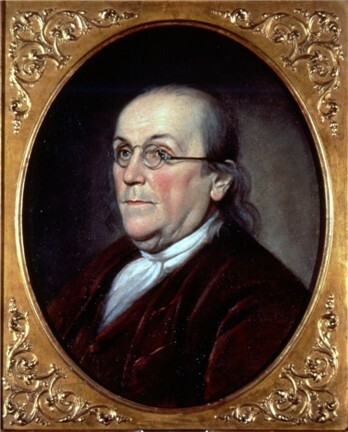 It was through the Junto that, in 1731 in Philadelphia, Franklin founded the first subscription library in America. (2) Adler, David A. B. Franklin, Printer. New York: Holiday House, 2001. (3) The Autobiography of Benjamin Franklin. I enjoyed this post. I’ve come in contact with B.Franklin often this month. My husband is reading Benjamin Franklin: An American Life by Walter Isaacson. And because he is a voracious reader, and I a listener, he reads to me frequently while I do other things. We’ve discussed the group he was a member of for years – whose mission centered around self-improvement. My interest was also peaked as I read of a system Franklin devised for strengthening thirteen virtues in his life. Gretchen Rubin models her happiness project on this system, in The Happiness Project, her recent book. I enjoy learning about the many people you write about. Keep up the great work! You’re right; Ben F was totally into self-improvement. I find him greatly amusing. I totally enjoy this post. I know for sure that Ben Franklin was always learning more and more new things. I’m glad you enjoyed this. Keep coming back. reallly good condition how much could it be worth. I guess you could put it for sale on ebay…. Nice post, am glad I found this. I had just read an extract on him but you have painted it clearly. Cheers!